Takeaway: Parents have very little time. They are also mobile, price-conscious, and often know exactly what they need – brand and all. To gain loyal parent shoppers, brands and retailers must understand how they shop and what they want from the experience. Here are five key insights according to our latest consumer research. 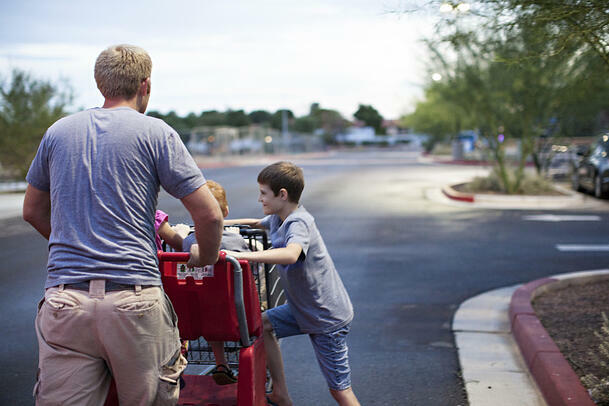 Mothers and fathers juggle shopping for themselves, their kids, and their homes. We recently asked parents and non-parents about how they shop and what makes them browse, compare and ultimately buy new products online. What we learned can help shape your strategy for selling toys, clothing, baby products, groceries, and other commonly purchased household items. Parents are buying a lot – mothers alone represent a spending power of $2.4 trillion a year, accounting for 85% of household purchases – but parents are shopping on their own terms, meaning on their own time and within their own budgets. They are mobile and spending-savvy. With little spare time and spare money, two ways marketers can gain loyal parent shoppers is offering easy tools that simplify the experience and maximize shopping opportunities during the parents’ rare quiet moments. Takeaway 1: Parents are always on-the-go. Mobile matters. Whether it's getting the kids out the door for school in the AM or juggling pick-up and afterschool activites, parents can rarely rely on focused time in a store or behind a computer screen. We found that 75% of parents with at least one child under 18 in the home shop via their mobile device, 18% more frequently than non-parents. Today’s on-the-go moms and dads use every precious free moment to cross off to-dos, so think of ways to help them make every moment efficient. Takeaway 2: Parents value value. Be clear about Price. Imagine, you're tapping your foot in the pediatrician waiting room. Whatever that rash is on his arm, there’s probably a bill on its way. As confirmed by our results, price is the most important factor for parents when shopping. Brand must develop clear and reliable ways to display accurate prices anywhere a mother or father might research the cost of an item. This includes new sales promotions and price updates. TakeAway 3: Parents rely on budgets and schedules. save them Money and time. Whether it's speeding through grocery aisles to get what’s needed before meltdown time or gearing up their sons or daughters for the next game day or school event, parents put a premium on saving time and money. Parents compare prices on their mobile device while in-store 65% of the time, compared to non-parents who do so 50% of the time. Either way, those are high percentages, so make price comparisons instant, easy, and unquestionable so frazzled parents are confident they are getting the best deal. TakeAway 4: parents often shop one-handed. Make it easy to multi-task in-store and online. Often when shopping in-store, children draw a parents attention and the actual errand is secondar. Non-parents are slightly more likely to visit the physical store, whereas parents might opt to purchase on their phone while a child naps in the back seat or is occupied briefly in an activity. Even at home there are distractions and impediements to sitting at a computer. Only 36% of parents surveyed said they shop on a desktop. Consider the ways you make it fast and easy for parents to get the information they need about what is at your stores before they make the trek into your store. And find ways to make it easy for a distracted, multi-tasking shopper to quickly find what they need. TakeAway 5: parents shop for others. Earn their loyalty with complete digital inventory lists. The coolest sneakers for that first day high school, a larger backpack, a favorite cereal, or the must-have toy of the season. Retailers either sell it, or they don’t. If parents can’t find what they want, they are more likely to search another site, whereas non-parents are more likely to just not buy. Parents build loyalty for the brands they trust or that their child likes. It’s not surprising that non-parents care more about variety, while parents only care about it 10% of the time.